LM: Engineering: Whats a Watts Link anyways? Last Thursday we hosted our first bi-weekly event called Burgers, Cars, and Welding or BCW. Their was a great turnout, and we hope for more at the next BCW on July 10, 2009. At the event we ate burgers, talked about cars, and most importantly welded. Colby Whipple (LM's Master Welder) built and demonstrated the Rally Fighter's Watts Link as Jay Rogers (LM's CEO) explained everything to the crowd. But, What's a Watts Link? Watt's Links are used in the rear axle of some car suspensions as an improvement over the Panhard rod (existing in most vehicles), which was designed in the early twentieth century. Both a Panhard rod, and a Watts Link intend to prevent sideways motion between the axle and body of the car. The Watts Link however approximates a vertical straight line motion much better. 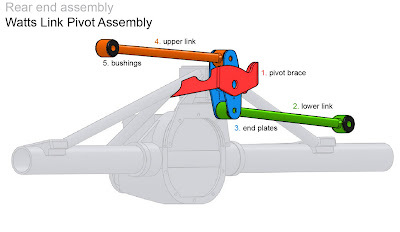 The Rally Fighter will employ the following Watts Link in its rear axle. 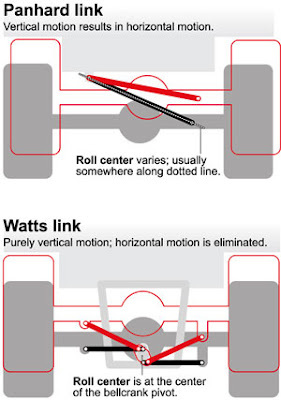 A Watts Link consists of two horizontal rods mounted at each side of the chassis. In between these two rods, a short vertical bar is connected. The center of this short vertical rod, the point which is constrained in a straight line motion, is mounted to the center of the axle. All pivoting points are free to rotate in a vertical plane of travel. Click here for the Watts Link build story!